I’m offering TWO Mixed-Media Art Journaling classes. Come to one or both! “Mixed Media Art Journaling Tips, Tricks & Techniques”. In this class, Janni will provide an introduction to Art Journaling, and help you to create beautiful art journal backgrounds using ink and paint applied in unexpected ways. Janni will also show you how to create double-pocket pages that are perfect for housing tags, photos, and other treasures inside your Art Journal. Janni will provide all of the materials for this class — so all you have to do is show up! (If you already have an Art Journal, bring it; Janni will have some hardback books for sale, $2 each, for those who don’t yet have an Art Journal). As always, participants will receive step-by-step take-home instructions. Cost: $35. 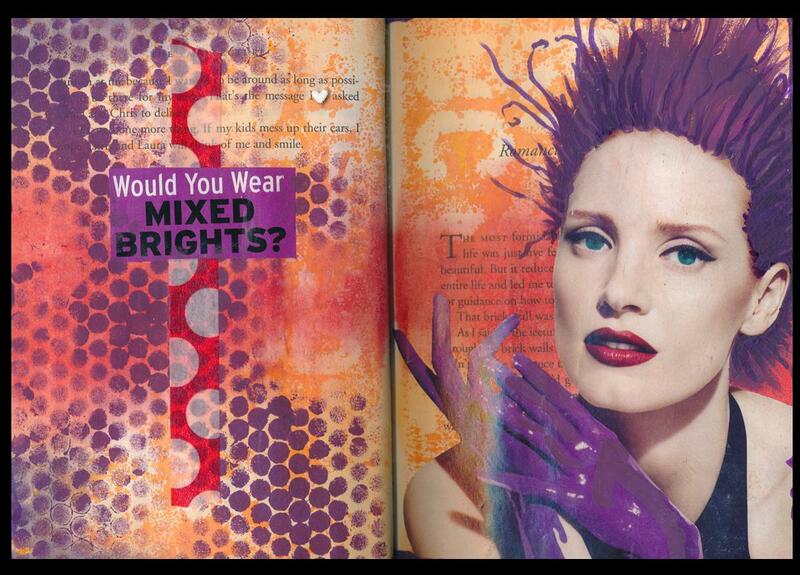 In this class, we’ll explore how to incorporate magazine words and images in mixed-media art journals using a variety of techniques. 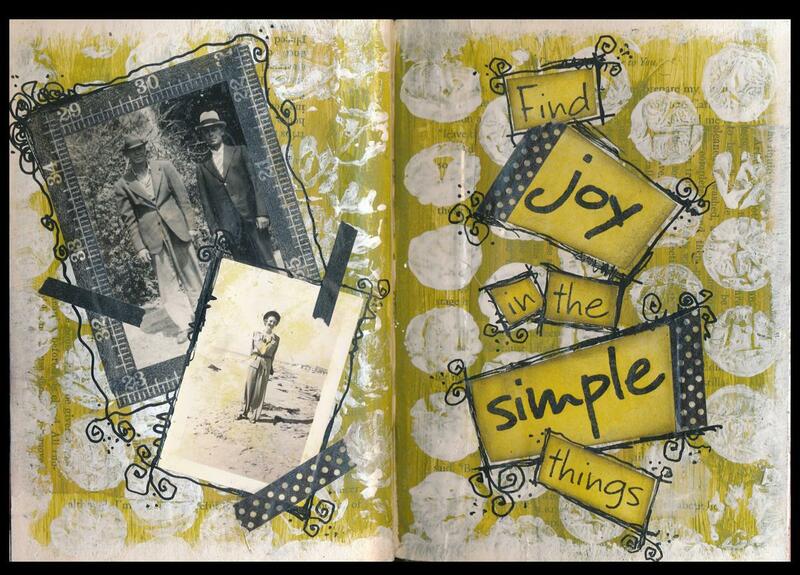 Janni will provide all of the materials for this class, except for magazines (bring magazines of ANY theme!) If you already have an Art Journal, bring it; Janni will have some hardback books for sale, $2 each, for those who don’t yet have an Art Journal. You’ll receive a 2-paged instruction sheet with tips and examples to inspire more exploration at home later. Cost: $35. contact me by email (janni.kretlow@hotmail.com) or through my blog. Click HERE to see more examples of my Art Journal Pages! I have been seeing all of the pages you have been doing with your journals…. You have been very busy and they are all great!!! I will take both of the classes with you #1 and #2 on the 2nd and the 12th. So let me know what you need from me, when to pay, etc. Hi Eileen, so glad you can attend both of the art journaling classes. You can pay when I see you at the next ATC trade, or at the time of the classes. I’ll send out more details as the time gets closer. I’m finally online this month with a great new hard drive! My friend Iryn Vekay wishes to join up for the Feb.2 Art Journaling class so that would make two additional participants if you have the space? She wants to prepare a “new baby” journal and I’d like to learn how to prepare family photos and my travels in a more creative presentation. I think we are on-track with these courses? I’ll be there for Jan.29 class as well and looking forward to your creative inspirations. From: Janni Kretlow Reply-To: Janni Kretlow Date: Thursday, January 19, 2017 at 9:22 PM To: Julia Covell Subject: [New post] Registration Now Open: TWO Mixed-Media Art Journaling classes! Hi Julia, this is great news! I’ve added you and Iryn to the list for Feb. 2. I’ll write to you directly through email to confirm some of the additional details. I really enjoyed the class last night – Thank You! Please sign me up for the other Art Journal Class on January 12th. HI Anne, sounds good! Looking forward to seeing you then!